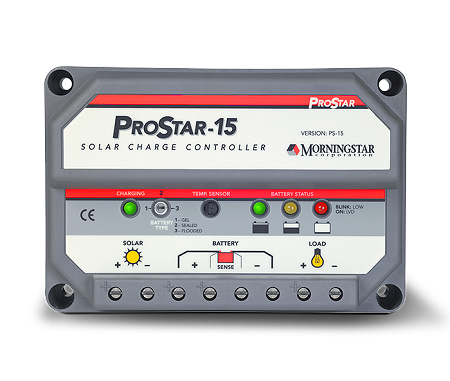 Night Disconnect: The solar array automatically disconnects at night to prevent reverse current leakage from the battery. Battery Sense: Good battery performance requires accurate charging. Voltage drops in the battery power cables can distort the battery charging. The Sense wires eliminate the voltage drops for optimized charging. Temperature Compensation: Four control setpoints (25°C reference) are compensated for temperature (PWM regulation, float, equalization, high voltage disconnect). The charging is compensated by –5 mV/°C /cell (–30mV/°C for a 12V battery). Compensation is limited to minus 30°C. 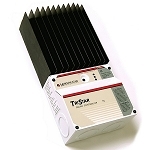 Remote Temperature Probe: An optional probe is available to measure temperature at a location away from the controller. This requires soldering 2 wires to the ProStar PCB. A precision 3-digit digital meter will continuously display battery voltage, solar current, and the load current. The meter automatically scrolls through these 3 displays. The 3 red LEDs will indicate which parameter is being displayed. The digital meter will operate from –30°C to +85°C. The values displayed are calibrated electronically in production and are accurate to within a few percent. Please note, however, that if the Battery Sense is not connected, the voltage displayed will be in error by the voltage drops in the battery wires. An optional remote temperature probe can be soldered to the ProStar assembly at any time. The standard cable length is 25 ft (7.6 m), and this can easily be extended to 100 ft (30 m) or longer. The 2 probe wires are soldered to the main board assembly between the temperature sensor and the green LED, at "J12".